-Background Vox transcript from Imperial farming hab G22.10 on Iskion V, before the events of 3808004 M31. Semi quick paintjob but loads of fun with these guys. It’s as if the kits were meant to be mixed! Zero putty needed with this lot. Colour-wise I approached this as a quick project where mood was king. 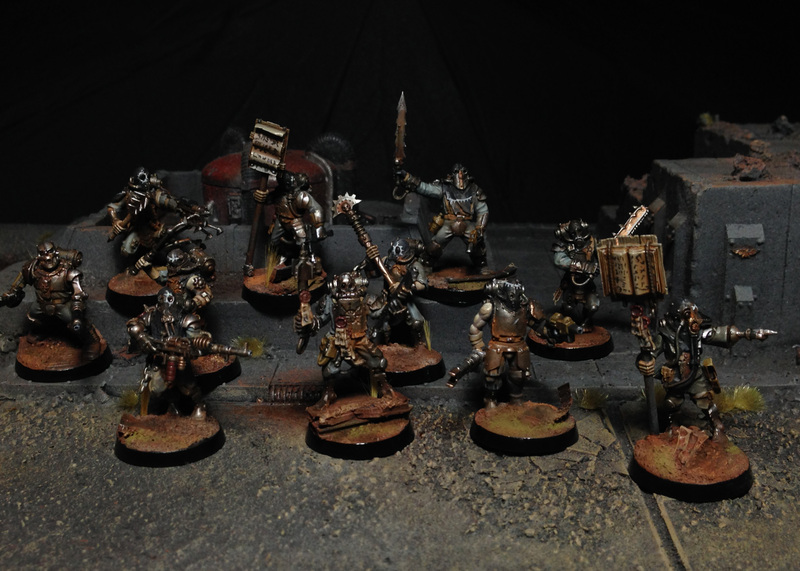 The models were airbrushed first with cold shades of grey and painted thoroughly very unsaturated. I then proceeded to go absolutely bonkers with brown washes and powders, for that dusty desert dweller look. Happy to be back painting! Thank you, it was a last minute addition but I’m happy it came to mind. I hope you could portray few of them individually, so we could really enjoy your paintjob in detail but its great as it is! Yeah, it just felt compulsory to get them out there fast. I’ll elaborate on the photos and story as Blind Faith part II is in the works! You’ve been a busy bee, haven’t you? Amazing work on these. The paintjob is sublime – all those muted drab colours but you manage to make them look rich and sumptous. Busy indeed! But more so on other fronts.. But I guess you will relate when I say it’s extremely fun to have the ball rolling again. Christmas will be a feast! Very nice – loads of brilliant ideas in there. 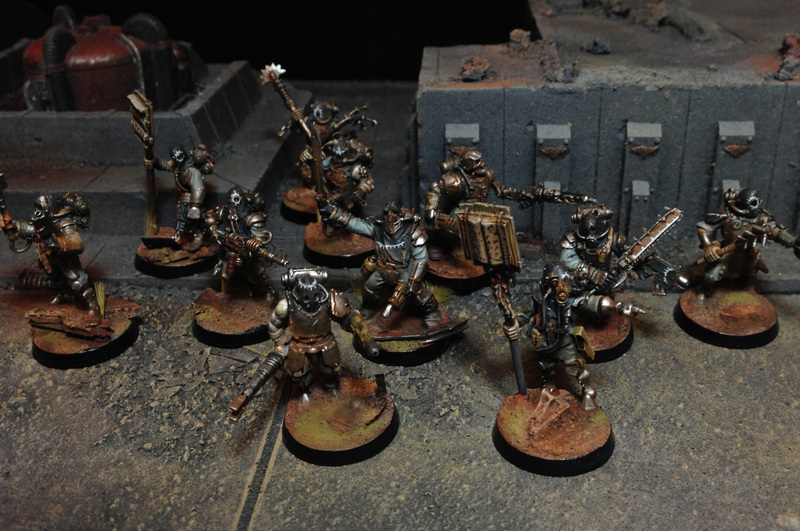 As you say cobbling together traitor guard is an absolute joy – so many of the kits just seem to go together naturally. Any chance of some larger pictures so we can get a better look at them all? The pictures are quite large if you right click and open in another tab. WordPress updated recently and I only figured out one way to post them.. But I’ll do my best to come up with new ones soon. Waiting on a certain blind horseman to return from a pilgrimage from nottingham. Aha! Feeling faintly daft now, my excuse is that I too am still getting used to the new WordPress. 🙂 Those guys are great though – even more impressive now I can see them close up. Tell me about it… I edited the post now to include links to the original large images. Enjoy! They look really cool, it would be nice to see a couple of close ups as it is a bit hard to make them out, but I really love the ash waste gang idea. Did you make them to game with? Will they get any vehicles? 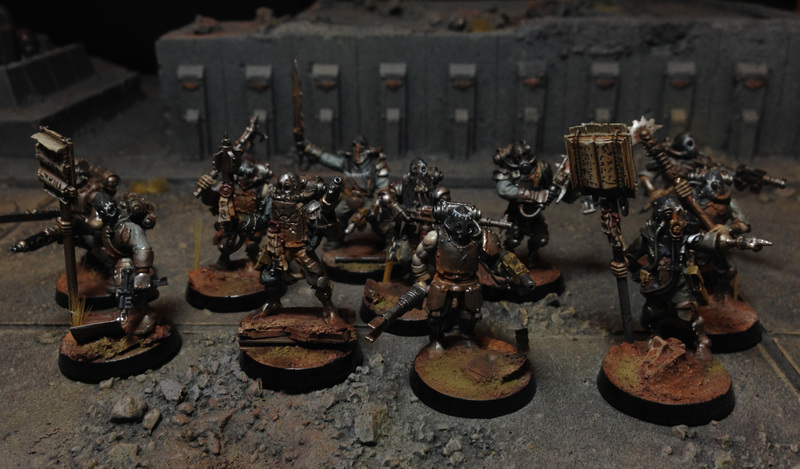 Would love to play a game of ash wastes against them with my pitslaves! Definitely some transports! I’m suffering from a lack of space and proper terrain at the moment, but games are certainly in the horizon. These look really stunning. Great mix of parts in these. The renegade torsos in particular work really well with the Skitarii legs. Yeah! The characters don’t have the standard 40k human proportions, but something is ever so slightly off, which serves the overall image quite well. Fantastic work!!! The overall scheme is spot on. I think it was smart not to tie them too clearly to the retinue and its use of red color. I think a heavily kit bashed dune tank made of the Mechanicus Crawler would be super cool for this lot! Woaw that’s a really sweet crew! The kit bash is fantastic, nothing seems out of place! And the colors are perfect! I love the green touch on the bases! Sweet Hesus these look awesome, Toni! I am lost for words. They are brilliant mate.